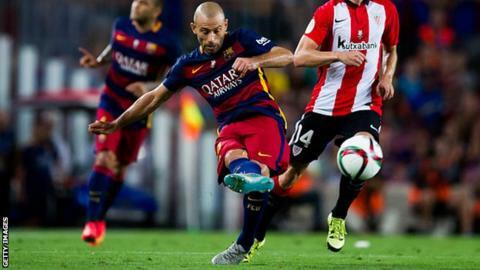 Barcelona's Argentina international Javier Mascherano has been charged with two counts of defrauding the Spanish tax authorities of a total of more than 1.5 million euros (£1.109m). The midfielder, 31, joined Barca from Liverpool in August 2010 for £17.25m. Mascherano is accused of defrauding the authorities of 587,822.01 euros (£434,681) in 2011 and 968,907.76 (£716,485.74) in 2012. Mascherano, who made no immediate public comment on the charges, this month paid the money owed plus almost 200,000 euros (£147,895) interest, the public prosecutor's office said. Local media reported this could work in his favour if he is found guilty. Mascherano's Barcelona and Argentina team mate Lionel Messi and his father, Jorge, has been caught up in a similar case involving earnings from image rights. They have denied they have done anything wrong. The parents of Barcelona forward Neymar have denied their son has done anything wrong after a judge formally accused the player of evading taxes.